It’s been a holiday staple of our family’s life for over twenty years now. For just prior to Thanksgiving, we will make the trek up to the northside of Houston for what we call simply “Pie Day.” Others have designated March 14 with that name, I know, in a clever pun on the numerical value of the mathematical symbol known as Pi. But for us, Pie Day is pretty literal, involving a trip to the Flying Saucer Pie Company on Crosstimbers near Shepherd. 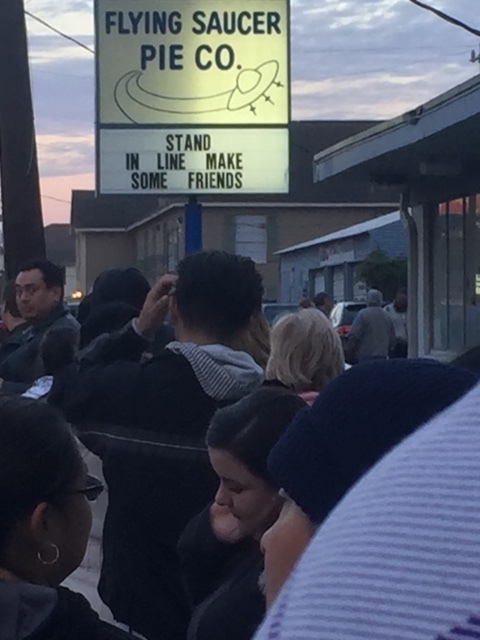 We go early, for the line to that small unassuming bakery, one of Houston’s oldest family owned businesses, starts at 4:30 or 5:00 a.m. on the Tuesday and Wednesday before Thanksgiving. Similarly, they don’t take any orders that week, all sales are first come, first serve, and when they’re out of popular pies—such as Pumpkin Cream—they’re usually done for the day. If you want one of the more than 35,000 pies that they sell during those days, thus, you need to come prepared for the wait and the weather. Of course, in the end, it’s just pie, albeit the most delicious we’ve ever had. The cream pies, in fact, are what you would hope someone might throw in your face sometime. But what Pie Day is really about is simply being a part of something greater than yourself—a community where all belong, no one is in a hurry (since it wouldn’t matter anyway), and there are no special privileges or advantages for a few. For just like at the foot of the cross, everyone is equal at Flying Saucer Pies. Just keep the line moving and be ready when you get inside the building and get to the counter. For there are folks behind you who have come to do the exact same thing. Thanksgiving wouldn’t be the same without it. I am a Elder in Susquehanna Conference, retired. People will leave the Church under any plan adopted and / or no plan approved. Strongly prefer Modified Traditional plan, could tolerate the Connectional plan, and would be very unhappy with the One Church Plan. One Church Plan would over time evolve into a Church with situational morality. We would reflect the culture rather than being faithful to scripture and church historical doctrine.